I’m so excited to share my daughter’s 5th birthday celebration. She just loves all the Disney princesses, and for this birthday she requested an Ariel party. 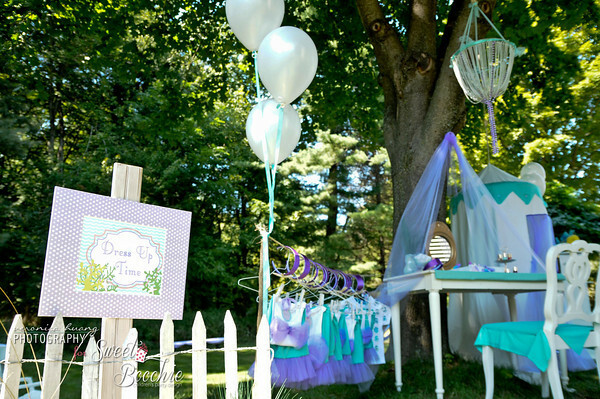 It was so much fun pulling it all together, and I was THRILLED that it was selected to be featured on Hostess with the Mostess as well as Kara’s Party ideas. Two of my favorite blogs! Check out the posts and more photos by Veronica Huang Photography at HWTM here and Kara’s Party Ideas here. Thank you Tricia! Yes the costumes and pop up dressing room were made by my mother-in-law who is an amazing sewer. I wouldn’t even know where to begin for a tutorial I would have to get back to you on that!